A portrait of Kurdistan Communities Union (KCK) female leader Bese Hozat. One hundred years after the borders in the Middle East were arbitrarily drawn by foreign powers, the whole region is being shaken by a war that could redesign it – with Kurds playing a major role in the process. New Internationalist travelled to the northern Iraq to meet and know more about the Kurdish vision. 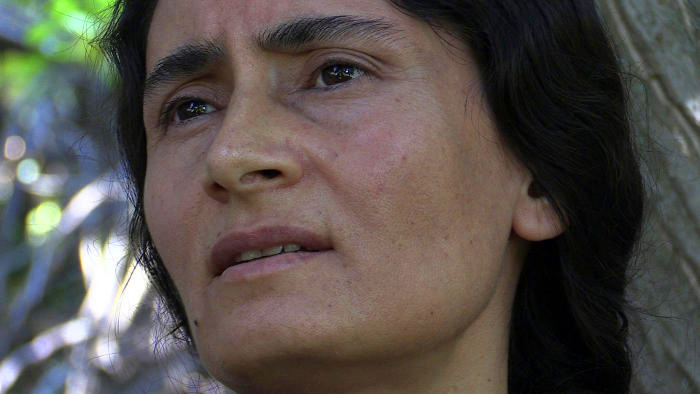 At a secret location in the Qandil mountains, we meet Bese Hozat, the female co-leader of the Kurdistan Communities Union (KCK), an umbrella organization for the Kurdistan Worker's Party (PKK) and other Kurdish groups. ‘We’re witnessing a third world war in the region,’ says Bese, amid the threatening echo of Turkish bombs hitting the area. One year ago, the last failed peace process between Ankara and the Kurds led to an escalation of tensions, against the backdrop of a failed coup against the Turkish government. Bese Hozat, what do you make of these events? For us, there was never a peace process as such. In 2013, Turkey’s ruling Justice and Development Party (AKP) was in sore need of a ceasefire due to a difficult situation both in the local and foreign arenas. Their main target was to get control of the state, so fighting was not in the interests of the AKP – their goal was to instrumentalize the so-called ‘process’. The ceasefire was just a tactical move. The Kurdish movement took significant steps in the ceasefire, such as the withdrawal of their fighters from Turkey and the release of prisoners. But the AKP soon realized the Kurdish movement was gaining strength thanks to the revolution in Rojava, the liberation of Yazidis and the fight against ISIS. All these events brought international recognition. Besides, Turkey’s Peoples’ Democratic Party (HDP), a party closer to the interests of Kurds, got 13 per cent of the votes in the June 2015 general election, so the AKP decided to kill the process and started a fierce fight against the Kurdish people in the cities. They started attacking the guerrillas with the most sophisticated techniques as well as by using Daesh (Isis). The heavy isolation of Abdullah Öcalan, the leader of the PKK, is yet another eloquent proof of this. He’s under heavy solitary confinement, and his lawyers have not been able to meet him since July 2011. Not even his family can meet him. The Committee for the Prevention of Torture (CPT) went to the İmralı Prison Island, where he’s held, to conduct an investigation on February 2016. But they made no public declaration whatsoever, claiming that Turkey didn’t allow them to make any statement. Is the EU turning a blind eye on the Kurdish issue in Turkey? EU country members ties with Turkey are deeply pragmatic. They show a very hypocritical approach. Europe knows Turkey is conducting genocide policies against the Kurdish people but they will never lift a finger for us. Before their eyes, and under their witness, entire Kurdish cities in the south-east of Turkey have been razed and destroyed. The EU is fully aware we’re suffering crimes against humanity but Turkey is blackmailing Brussels by playing the refugee crisis card. How do you compare the last military operation in Turkish areas of Kurdistan to those back in the 1980s and the 1990s, which resulted in thousands of villages being destroyed and a mass population displacement? Turkey has been waging a three-decade long war against the Kurds with the backing of NATO. The difference between the two mass scale operations is that Turkey is no longer fighting with its ground forces because they have proved useless against us. So they’re fighting us by using their air force as well as more sophisticated weapons. Nowadays we’re facing the is the most intense war period against the Kurdish movement. Iraqi Kurdish leaders have decided to call an independence referendum on 25 September. Can this pose a milestone in the Kurdish struggle? A referendum is a natural and democratic right of the people’s, regardless of its aims. The Kurds in the four parts of Kurdistan are entitled to their right of self-determination and also to their right for a free life in Kurdistan. However, our movement’s approach is not about building a state – a state system will not be to the benefit of the Kurdish people but a thorn in their side. A Kurdish state will never be a solution to the Kurdish question. It would deepen the fight with our neighbours and bring decades of war against the Arabs well as chaos and suffering. We vow for the Democratic Confederalism system for the four parts of Kurdistan. A democratic federal system will be more libertarian and democratic for our people in South Kurdistan (Iraqi Kurdistan region). The era for nation-states is over. A state does not buy freedom because it’s a bourgeoisie system that enforces repression on the people by an elite. The Kurdish movement you lead has consistently denounced alleged ties between Masoud Barzani, President of the Iraqi Kurdistan region, and Turkey’s Prime Minister Erdoğan. However, Barzani was the one who called for a referendum on Iraqi Kurdistan’s independence, which doesn’t seem to be in Ankara’s interests. Barzani called for a referendum because of the difficulties he’s facing. There is no democracy in South Kurdistan. The Kurdish Parliament has been blocked for more than two years, the opposition has been silenced and the people are facing grave economic and social problems. Barzani and Erdoğan’s relations are dirty, there are a lot of secret agreements we think are against the interests of the Kurdish people – like the one which allows Kurdish oil be piped out directly to Turkey [bypassing the Iraqi government]. Erdoğan and the AKP won’t support the referendum, but they need the support of the KDP for their campaign against the Kurds. The sad truth is that Barzani represents the legacy of collaborative Kurds and Turkey, that of an occupying force. Turkey is building a new wall on its border with Iran, dissecting predominantly Kurdish areas on both sides of the border. What is your response to this? Turkey is building walls on its borders as a sign of their policies. but the aspirations of the people for freedom cannot be contained by a wall. Before, our borders were littered by barbed wire and minefields, but those proved useless, so now they have resorted to a wall. Our response will be to continue raising the political struggle in the four parts of Kurdistan until these walls too become meaningless. Washington is backing your people in Syria but the local Kurds have also struck deals with the Russians. What do you think of the role both major powers are playing in the region? The interest in the Kurds of these two powers is rooted in their regional interests and their plans to redesign the region. They want to minimize the power of traditional regional states which are too dogmatic in their positions – because they are an obstacle for global capital. We’re witnessing a third ‘world war’ in the region, which started in 1990-91 with the Gulf War, and which then brought war to Afghanistan and Iraq. We can also include the arrest of Öcalan as part of this chain of events. In this situation, the Kurds have become the one and only democratic force. They’re fighting Daesh and Al-Qaeda, both of which pose a great threat to human values. The Kurds are playing a big role in redesigning the region along democratic lines, so the US and Russia have strengthened relations with the Kurds in a bid to further their own interests. Ankara claims arms handed to the Kurdish forces in Syria by the US are also falling into the hands of the PKK. Is there any truth to this in your view? The PKK was present long before YPG came to exist, it has a 45-year long struggle behind it, and it has waged armed resistance for over 30 years – whereas the YPG was created only five years ago. Getting weapons has never been a problem for the PKK, especially in a region like this. You have claimed Al Qaeda and Daesh are ‘instruments created by the capitalist system’. Could you be more specific? The seed was already planted in the region. After the fall of Saddam Hussein, the old Baathists approached-Al Qaeda, but the US and Europe capitalized on this force because they wanted to use it as an asset against the hegemony of Shiites. The US, Israel and Britain empowered radical fanatic Sunni Islamic groups as a means to contain the spread of Shia hegemony in the region. Turkey, Saudi Arabia and Qatar also played a big role in the rooting and flourishing of such groups. Even after Saddam Hussein was hanged, Turkey had very good relations with Sunni groups around him. With the beginning of the war in Syria, Turkey established direct relations with Daesh. The US, Israel and Britain supported Daesh until they realized it had got out of their control. It was only then that these powers decided to take measures, but Saudi Arabia, Turkey and Qatar stuck to their previous policies. Saudi Arabia started changing its policies only recently – when it had problems with Washington – but Turkey and Qatar have not yet cut all their relations with Daesh. One of the main reasons for this is that the cadres of the AKP are very close to these radical ideas. Daesh is being progressively minimized, but the AKP is taking the cover of the legitimacy of the state to build a state of its own. Conservative. It's no longer a secular state but a religious, sectarian, nationalist and racist state. It’s an exclusive system which denies different social, religious and cultural identities within its borders. Nowadays, the biggest threat to the region is not Daesh but the regime the AKP is building in Turkey. All photos by Karlos Zurutuza.